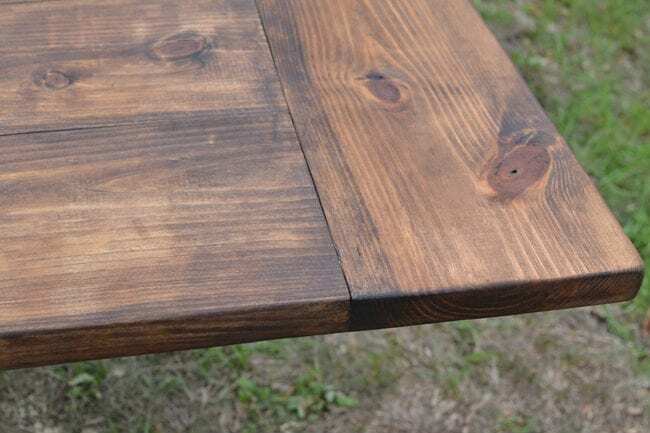 The DIY Farmhouse Table post includes affiliate links to items I use and recommend. If you make a purchase I receive a small commission. 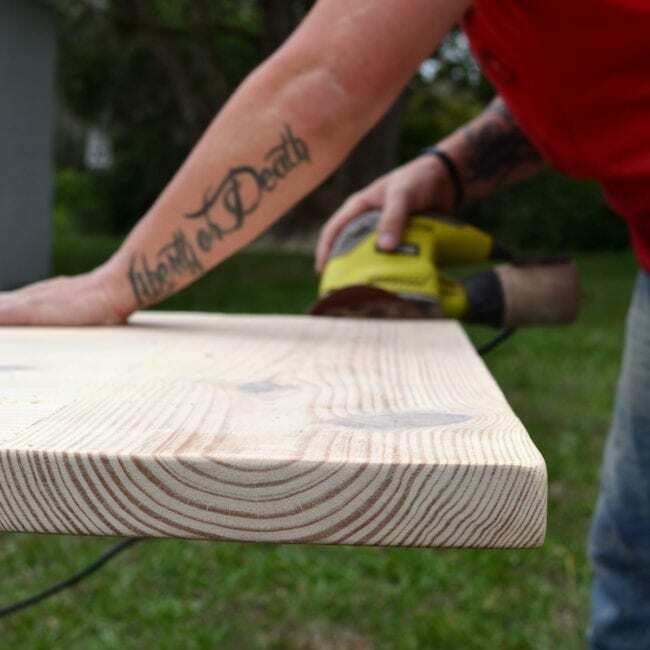 Guess who won the vote on how we finish our dining room table? Find out down below. Gotcha! If you participated in the first vote for The House That Votes Built thank you so much. We loved checking the votes every morning and afternoon and talking smack to each other. Mike and I pitched our choices and asked you to vote last week. 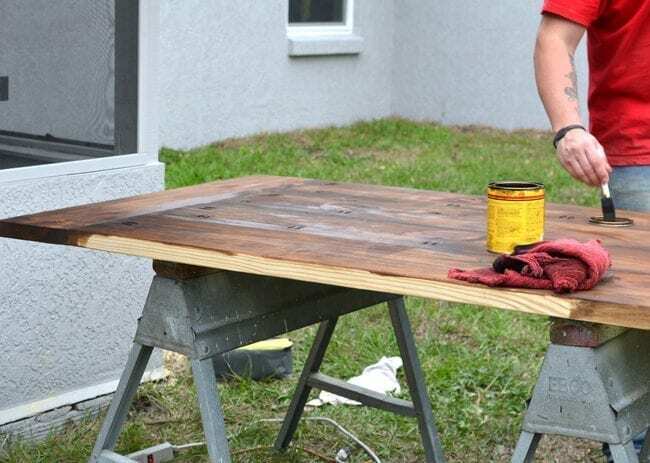 He wanted the DIY farmhouse table to have a white base and I wanted the dark, almost black base. We were neck and neck until the final day when someone pulled ahead and beat the other by 6 votes. 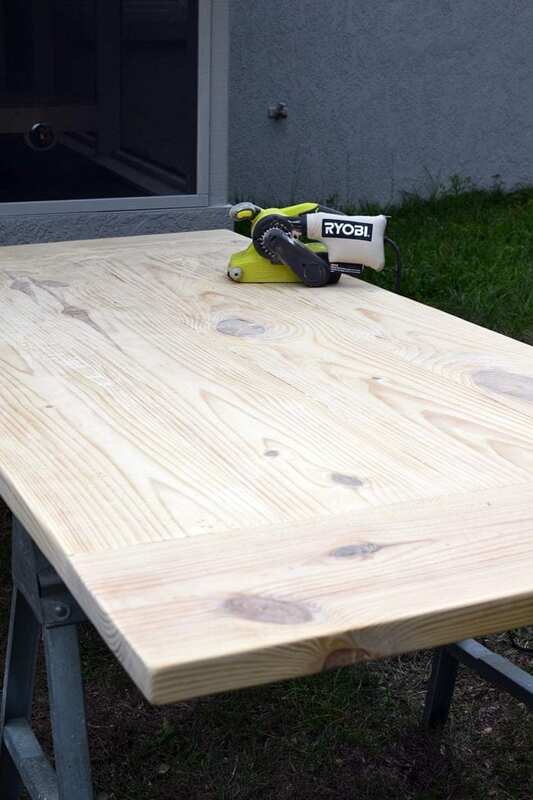 We were both good sports and last Sunday we pulled the tabletop out into the yard and sanded it together with our new Ryobi belt sander and my trusty corner sander. I’m convinced our new neighbors probably already hate us. 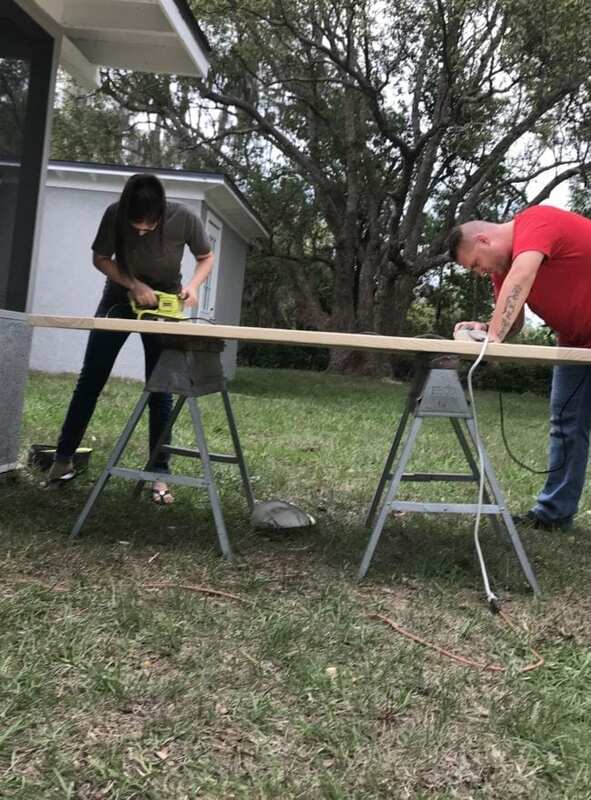 We were sanding Sunday, sawing Monday and our kids are on Spring break. The four of them have been running crazy through the back yard. Their inside voices are loud so you can image what their outside voices sound like. Basically screaming, yelling and the most high pitch annoying noise you can imagine. Don’t forget the frequent crying when one does something the other doesn’t like. Who knows what I’m talkin’ about!? While our neighbors hate us our shoulders hate us too. We woke up the next day in pain from handling the belt sander. That thing was a beast. Even though I’m still putting the finishing touches on the table I am already thinking about what chairs we should pair with the table. Right here is where Mike rolls his eyes because I am compulsive and constantly jumping the gun. Right here is also where he says something like let’s just finish the table first. Ain’t nobody got time for that. I have my eye on the Essie Upholstered Chair or the Royal Palm Beach Dining Chair. I showed Mike the chairs and he will be finding a set he likes so we can bring it up for voting. Possibly vote #2? BTW – Are you signed up to vote? Do you like giving your opinion on home design? Guess what? Join a whole slew of people waiting to vote. We want you to vote on the choices that will turn our house into a home! Watch our house transform before your eyes! 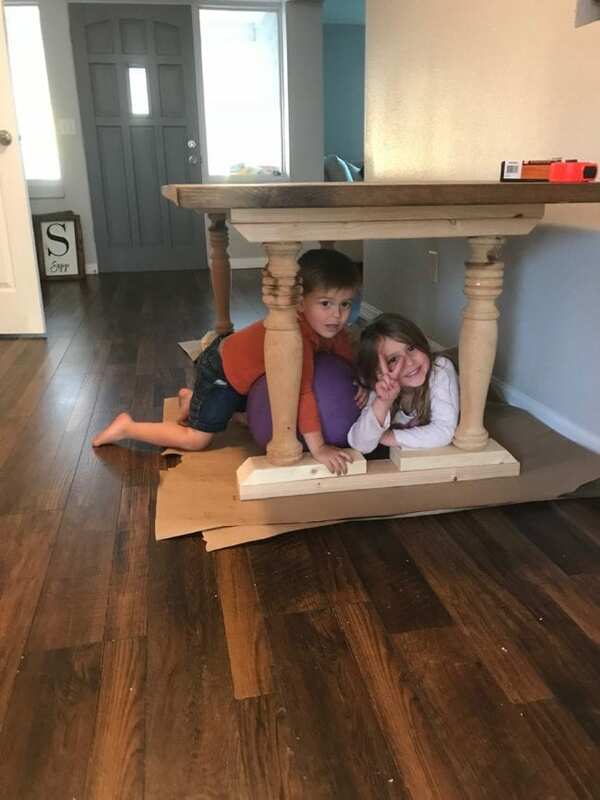 In the voting email I wasn’t finished building the table so I couldn’t share any pictures. We are now done putting the table together minus one cross piece that goes along the bottom connecting the two sets of legs. 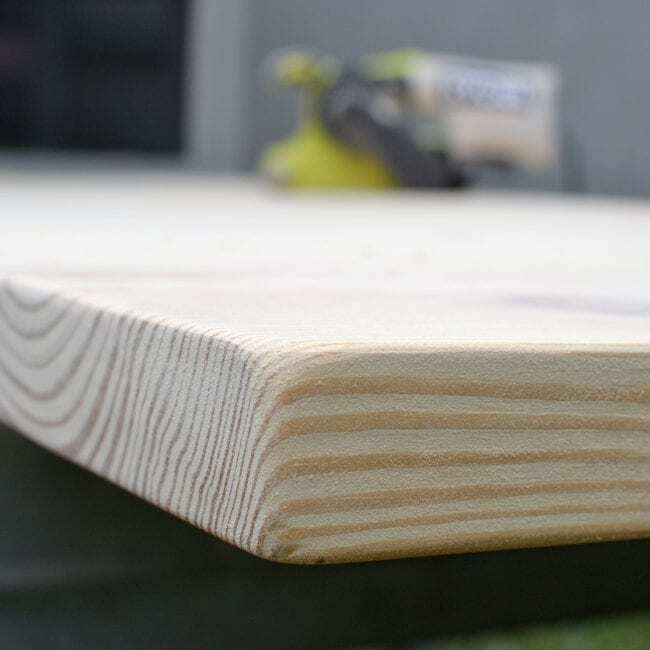 This was the tabletop once we finished sanding. It is 7 feet long. This was me once we finished sanding. 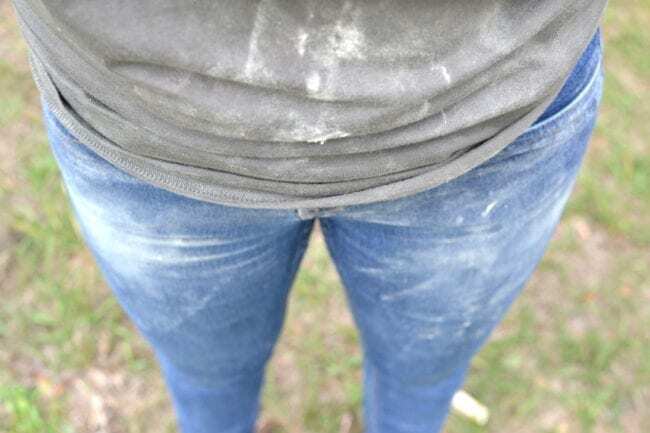 Mike and I were both covered in sawdust. The tabletop was stained in Minwax Provincial. MY normal MO is to go dark but we went another direction after seeing shelves my parents recently stained with Provincial. The stain went on darker than we expected but once it dried it lightened up as the wood soaked it in. We stained both the top and bottom of the table. 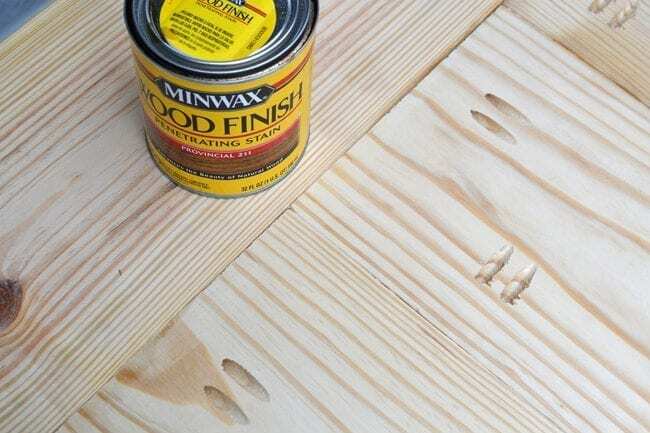 The tip to staining is to use a lint free cloth and apply it in the direction of the wood grain. Then go behind and wipe it with a dry lint free cloth to soak up the excess. Mike dabbed in the seams of the wood and the holes on the bottom of the tabletop with a foam brush and I immediately wiped them. It was a true team effort. The next two days I spent finishing the legs, base or whatever they should be called and moved the farmhouse table inside. This is where we will finish it up and paint the base. The kids are loving it already. They are doing their part and antiquing it like Mike mentioned. Soon enough it will have Hot Wheel marks and gashes in it. So are you still wondering who won? I, Kelsey, won! I beat Mike by a handful of votes. We are painting the base in a dark brown almost black color. Stay tuned for the final reveal. SO glad to help pick the “winner” … ! As I mentioned, Kelsey, your idea seems more unique, and I can’t wait to see the finished beauty! (Yes ~ distressed can be beautiful!) You’ve found a great way to resolve disagreements on design decisions … so that nobody can be upset, right?!? It’s a really fair way to work out those problems!